Alexander Schlichter brings us the latest creation from Theo Jansen, the man who brought us the majestical Strandbeest, a mechanical wooden structure that had the ability to move and crawl across the land. Director of photography for the previous film, Alexander is also a author, who lives and works out of a small village near Hannover. Animarias Umerus the latest member of the family was filmed by Alexander on the beaches of Scheveningen, Netherlands in June of last year and the footage of this has just been put out, so here it is for us all to gaze upon. 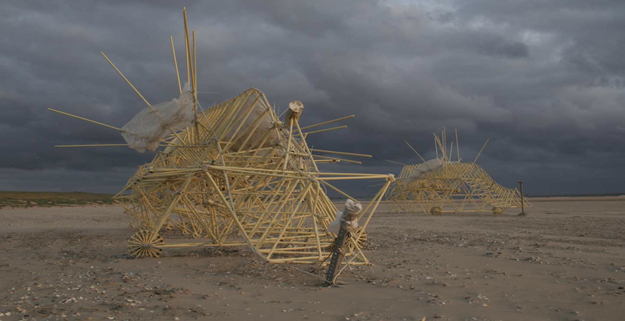 Above we have the larger and first member of the project Strandbeest, and below in the video footage is the younger Animaris Umerus. The project has a whole has a whole website dedicated to it, which is linked below.